Best Selection, Pricing and Services in Chicago Guaranteed! Dock Seals and Shelters are engineered to stand up to the rigors of the job. 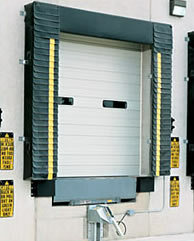 Each is designed to your specific application, providing an effective seal around the perimeter of the loading dock door. Seal models are available for Fixed Header, Adjustable Head or Curtain Header versions. Shelters are effective in controlling weather, fumes, and pests while allowing full access to the rear of the trailer. All products are constructed from the highest quality materials available today, including fabrics in various weights and colors. Dock Levelers are designed for ease of use and built for extreme heavy-duty function. Edge-of-dock or pit-mounted, mechanically-operated or hydraulically-operated, there's a Dock Leveler system to handle the toughest job. 1-630-350-7667 or fill out our contact form.